Dried scallop (干贝, gan bei), or conpoy, is made from the adductor muscles of scallops. Pungent and compact, it has a highly concentrated flavor of the sea. Different from dried shrimp, which are also widely used in Chinese cuisine, conpoy is known for its sweet and umami aroma. Dried scallop is a common ingredient in Cantonese cuisine. It is also a main ingredient in XO sauce. It is often used in congees, soups, and sauces to infuse a rich, savory flavor without adding any meat or stock to the dish. Dried scallop is like a stock cube. It has a superior taste and is even very tasty itself. 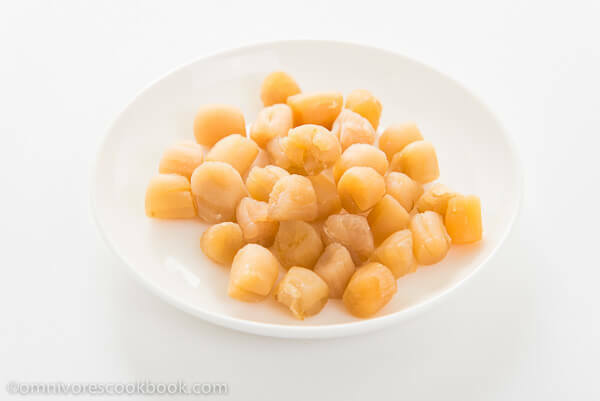 There are two main types of conpoy: one made from river scallops and one made from sea scallops (also known as hotate in Japanese). The river variety has a milder and sweeter flavor and is often used in soup and congee. They won’t be particularly overwhelming in a light dish. Before using, gently rinse dried scallop a few times. Rehydrate in tap water for 2 to 3 hours, then drain. You can tear it into smaller pieces, so as to infuse more flavor into a dish. You can store dried scallop in an airtight jar in the fridge for up to a year. You can also freeze it to store for even longer. Dried scallop might be difficult to find. Check out Asian markets, especially ones that sell Cantonese food items.